Field service is an inherently mobile business activity, so it’s not surprising that the vast majority of survey respondents are utilizing some form of mobile technology . According to the survey, 86 percent of respondents are currently using mobile devices. The types of applications these field service organizations (FSOs) are running on their mobile devices can vary from basic email/messaging or work order management to more complex fleet management, knowledge management, and diagnostic tools. The rapid evolution of field service software has driven new investments in mobile hardware, because FSOs want to take advantage of the new features and functions available in these advanced platforms. It’s no surprise, then, that some companies are using multiple types of devices to address their varied and quickly changing business needs. The largest single group of respondents (32 percent) is using a combination of mobile devices, which speaks to the complexity of these deployments and the varied application needs encountered by FSOs. The use of multiple devices was down slightly, however, from the 36 percent that reported a multidevice environment in 2017. Beverage equipment company BUNN is typical of these types of heterogeneous deployments. Technicians use a mix of iPhones and iPads in its service division, and the company utilizes a field service management platform from GE Digital/ ServiceMax that works across all of those devices. BUNN has also been able to utilize its new augmented reality and other technologies on its mobile computers. When we drill down into the data and look at specific types of devices, smartphones and handhelds are clearly the devices of choice for highly mobile technicians. A combined 46.6 percent of companies are using an iPhone, Android phone, or rugged smartphone/handheld. Approximately 16 percent are using a tablet (either consumer or rugged). Smartphone manufacturers in every sector are increasingly targeting enterprise applications as high penetration in the consumer market has slowed sales growth. According to VDC Research data, the volume of smartphones deployed in line of business applications reached 34 million in 2016 and will grow to 42 million by 2020. Rugged-device manufacturers have also increased their investments in adopting the Android platform and creating more touch-centric devices and interfaces. 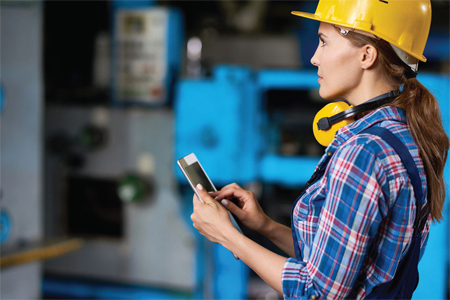 These emerging rugged and semi-rugged smartphone devices have expanded the opportunity for mobilizing manual workflows in field service and other markets. When it comes to selection criteria, portability was a top factor for the largest group of respondents, at 45 percent. That’s important, because not all mobile devices are highly portable. One reason why so many formerly laptop-based field service applications quickly transitioned to tablets over the past decade has been that those laptops still required technicians to return to their vehicle or another location away from the point of activity in order to access or input data. Tablets were lighter, easier to carry, and much easier to handle on a work site. According to VDC Research data, the volume of smartphones deployed in line of business applications reached 34 million in 2016 and will grow to 42 million by 2020. At Gosiger, end-user requirements for better portability drove mobile device selection. The previous solution the company used (which relied on emailing Excel files) wasn’t working well, in part because the technicians’ laptops were not working well. Technicians wanted a way to view and complete work orders from their mobile phones. The company chose its solution (IFS Field Service Management) based on its ability to provide the back office functions it needed and the mobile capabilities the technicians were clamoring for. Gosiger provided company-owned smartphones (both iOS and Android) to technicians based on their preferences. Because the interface was familiar, most of the training could be conducted remotely. The transition away from the laptops has saved time and made technicians more efficient. Wireless communication capabilities was the next most popular selection criteria among respondents at 39 percent, followed by mobile device operating systems (31 percent). Increasingly, technicians need access to real-time data — not just immediate work order information, but also customer and equipment histories, as well as the ability to share information with other technicians, order parts, and provide real-time job status updates to ensure SLA compliance and keep customers up to date. The question of which OS to utilize has become even more important as Microsoft ends support for its traditional mobile platforms (like Windows Embedded Handheld), and more end users turn to Android-based rugged devices for field service applications. Other top selection criteria included field worker familiarity (22 percent), durability/ruggedness (20 percent), and ergonomics and cost (both at 19 percent). 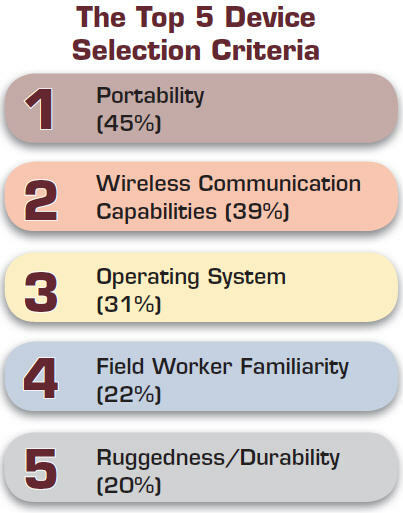 Field worker familiarity can have a significant effect on the success of a mobile deployment. This is especially true as more rugged device manufacturers adopt the Android platform, and field service applications take advantage of touch screen technology and more intuitive user interfaces. If field technicians are able to more quickly understand the device and the associated applications, training times and costs are reduced, the deployment can be completed more quickly, and it is easier for technicians to improve efficiency/productivity with a shorter learning curve. That boosts the ROI of the solution. End-user satisfaction was high, with nearly 90 percent of respondents reporting that their workers were happy with the current mobile device fleet.